Over the past five years, the world's largest pharmaceutical companies have invested billions of US dollars in research capacity in China, drawn there by the country's low research costs, enormous talent pool, and rapidly expanding market for health care. 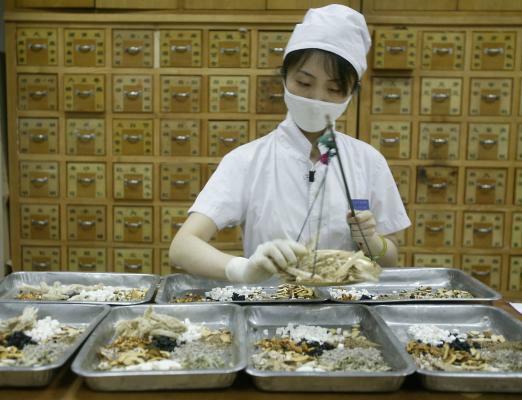 But the research facilities they have built in China are now leveraging their location to tap into the country's wealth of traditional Chinese medicine (TCM), with the hope that the ancient practices can point the way to new treatments. Almost all general hospitals in China have TCM departments and one in ten physicians is trained exclusively in TCM, with most western-medicine doctors also receiving some training. McKinsey report estimates that in China in 2011 there were $13 billion in sales of herbal medicines formulated according to TCM principles. The Chinese Government has fostered the sector in various ways, such as providing high rates of reimbursement for TCM through its national insurance programmes and ensuring the availability of common traditional treatments. More than a third of the drugs on the country's essential drug list are TCMs. GlaxoSmithKline (GSK) is one of several pharmaceutical giants that have taken an active interest. GSK built a major research centre in Shanghai in 2007, and at the beginning of 2012 it announced the formation of a new unit there devoted to the study of TCM. Zang Jingwu, who heads the research centre, says the unit is building a library of compounds derived from Chinese herbs that it will use to screen against known molecular targets, in the hope of identifying novel chemical scaffolds for engineering new drugs. GSK's network of local researchers has been crucial in amassing the library, which Zang describes as “quite sizeable”. The unit is also deconstructing existing TCM treatments with the goal of developing its own evidence-based prescription TCMs for treating disorders ranging from Alzheimer's disease to inflammatory diseases to cancer. At Beijing's Guang'anmen Hospital, where one of the country's earliest TCM oncology departments was established, most of the inpatients have already received western treatment for their cancer or are receiving treatment that integrates chemotherapy and TCM. Those receiving exclusively TCM are predominantly late-stage patients with poor prognoses who still find the traditional treatment improves their quality of life. Lin Hongsheng, who directs the department, says she was sceptical about TCM when she arrived there in 1976 but has since become convinced of its value, particularly for ameliorating the side-effects of chemotherapy. In studies of late-stage cancer patients she has undertaken there with her colleagues, integrated TCM and western treatment has given better results than exclusively western treatment.